Taking an everyday ritual and transforming it into an artistic process, The Poetry of Toast, was where the literary, olfactory and nostalgic powers of toast were explored... and devoured. Attendees were knighted with a Victorian toasting fork amulet before being lead to the toast library, where the quotes ranged from Wind in the Willows to Margaret Atwood. Their nostalgia successfully stimulated, they carried on to the toasting station, following the familiar steps before eventually using cinnamon (or chocolate) and a laser-cut stencil to print poetry on their hot buttered toast. 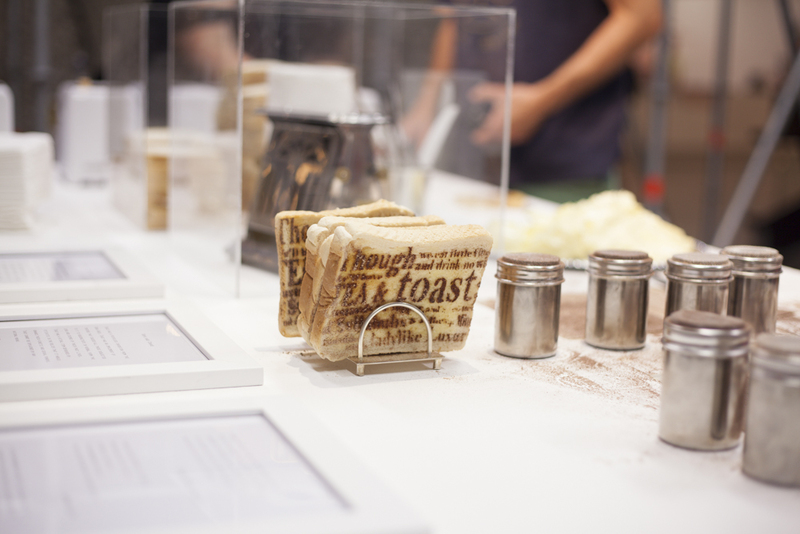 The Poetry of Toast | Part of the DesignMarketo residency at Doug Aitken's Station to Station | Barbican Art Gallery, Silk St, London EC2Y 8DS | 19 July 2015.